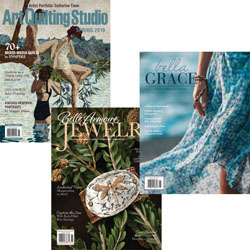 We can set up subscriptions to Stampington magazines for you. They are despatched from Rainbow Silks as soon as deliveries arrive from the States. WE ARE SORRY THAT WE DO NOT OFFER SUBSCRIPTIONS OUTSIDE THE UK. For pay-per-issue subscriptions we charge your card once we know the magazine is on it's way, so that your copy is not held up by administration. You can also prepay for a year's subscription (or more if you wish). You can start your subscription with the current or the next issue. Subscriptions are for delivery within the UK only, and postage within the UK is included in the price of the subscription. IF PAYING BY PAYPAL PLEASE SELECT THE ONE YEAR PRE-PAID SUBSCRIPTION as we are unable to take payment for future issues. For pay-per-issue the cost of the FIRST ISSUE of your subscription is shown. You will be charged this amount each issue, and will be notified if the rates change. You can also order back-issues when available. You can cancel your pay-per-issue subscription at any time - please email with your name and postcode with a brief message. Many magazines are not repeated, so set up a subscription to make sure that you do not miss the new issues of your favourite magazines. JULY 2018 - Stampington are in the process of discontinuing several of their magazines. The ones shown are the titles that we expect to be going forward, and if you take out a subscription you will be notified of any change. PLEASE NOTE Prices are subject to increase at any time due to price changes by our supplie or shippers, changes in exchange rates etc. You will be notified of any changes which could be part-way through a prepaid subscription.